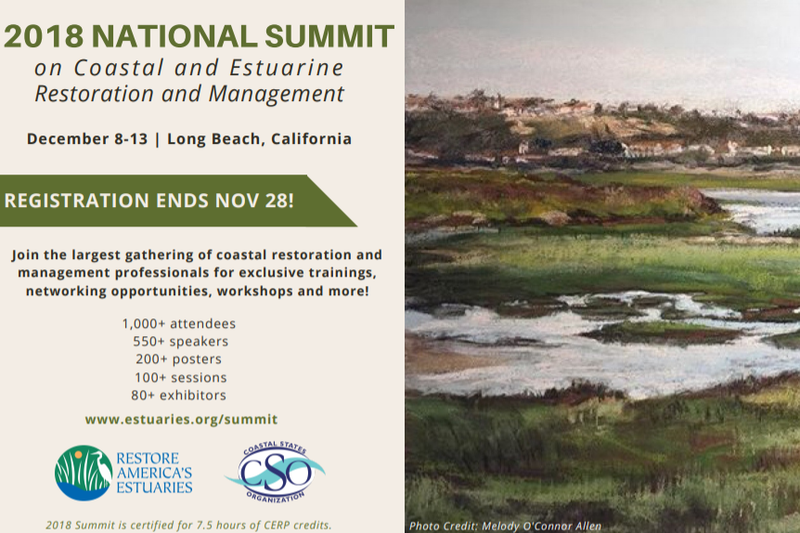 The 9th National Summit on Coastal and Estuarine Restoration and Management takes place December 8-13, 2018 in Long Beach, California. This premiere event brings together more than 1,000 coastal professionals to network, learn from their peers, and engage in cutting-edge discussions. Attendees can get their hands dirty during one of the many field trips, attend one of 100+ educational sessions, build your network of professionals and business clients, and reconnect with colleagues at one of the many receptions. Restore America’s Estuaries (RAE) and the Coastal States Organization (CSO) proudly present the 9th National Summit, which will bring together the coastal restoration and management communities for an integrated discussion to explore issues, solutions, and lessons learned in their work. The Summit will provide timely and much-needed attention to the challenges and opportunities for coastal and estuarine restoration and management. It will bring together a unique blend of people who are involved in policy, science, strategy, business, and on-the-ground restoration and management. Learn more about what will be offered at this year’s Summit here. The Summit Program will address all aspects of coastal and estuarine restoration and management, in all ecosystems, at all scales, and in all regions, including the Great Lakes and international locales. These topics are crucial as coastal communities pursue new, more robust strategies to effectively manage, protect, and restore their resources in a changing climate. Ensuring these resources, and the communities that rely on them, are resilient now and into the future will be a particular focus. The Summit is an international gathering encompassing all disciplines within the coastal and estuarine restoration and management communities. RAE and CSO will work with 200 partnering and supporting organizations to develop and host the Summit and we anticipate more than 1,300 attendees from the restoration and management communities: non-profit and community organizations, Indian Country, Indigenous Peoples, academic and research institutions, businesses with an interest in the coast, and agencies from all levels of government. Restoration and management practitioners, citizens and community leaders, consultants, scientists, educators, planners, engineers, students, volunteers, philanthropists, program managers, field staff, contractors, regulators, and others involved in restoration and management efforts are expected and encouraged to participate. Registration ends November 28, so don’t miss out! The Schedule at a Glance can be viewed by clicking here. The 2018 Summit is for 7.5 hours of Certified Ecological Restoration Practioner (CERP) credits!